This week I will turn 28 and for the first time, it isn’t bothering me as much as other birthdays. I always liked the number 28, perhaps as it’s my birth date and even numbers are always preferable in my eyes. Two for one pizzas, four friends, six bottles of prosecco, Christmases with 16 people (ok, 15 and one dog) crammed around different chairs and tables. Just a few of my favourite (even) things. I feel like 28 is this age where you had a picture in your mind of what your life would look like when you are a teen. It’s your late twenties (ok, that part I don’t like as much) and you imagine yourself with your life completely together. You might think you’d be married, or have 2.4 kids or own a house or be living in New York a la Carrie Bradshaw with one column a week to fill and the rest of your time spent drinking Cosmopolitans and spending rent money on shoes. In the last few days of being 27, I’m realising it’s perfectly ok to not have it all figured out and that life is far from predictable. And so to two cocktails. One for you and one for me, or perhaps both for me because I’m turning 28 and I need the extra fuel. Frozen rosé cocktails aren’t exactly a new phenomenon but I fancied trying something new to blog about and the drinks section has been somewhat neglected for a while. I’m a bit of a snob when it comes to drinking rosé – it must be ice cold and so pale, it’s practically white wine. I also prefer it dry rather than berry sweet but feel free to use your favourite rosé here. 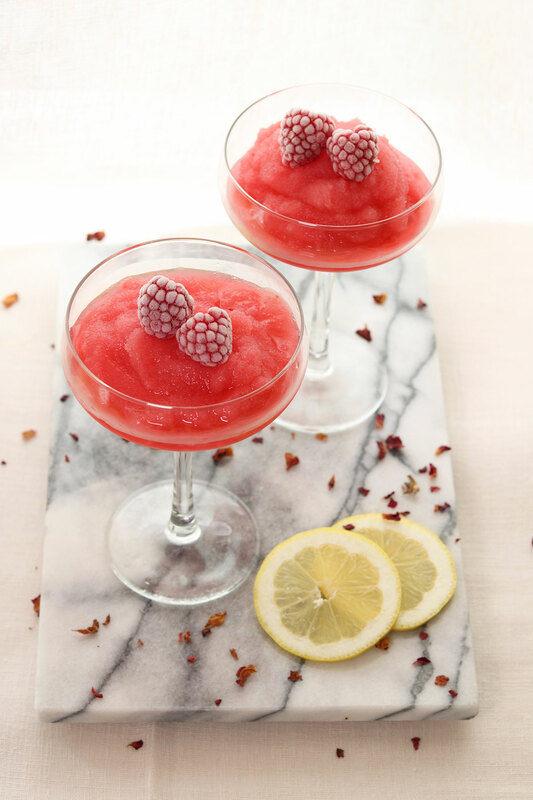 I chose raspberries as I love their sour sweetness and with a touch of lemon, these slushies just sing summer. Cheers. This recipe is easily doubled, tripled etc when making a large batch for a crowd. Serve in jugs and let people help themselves. The night before you want to make your cocktails, pour the wine into a sandwich bag and seal shut. Place in the freezer to freeze overnight. The alcohol will ensure it won’t freeze solid, so it will be easy to blend the next day. In a food processor or a blender, add the raspberries and a squeeze of lemon juice then blitz until smooth. Add sugar to taste if your berries are a little tart. Run the raspberry puree through a sieve to remove the seeds then place back in the blender. 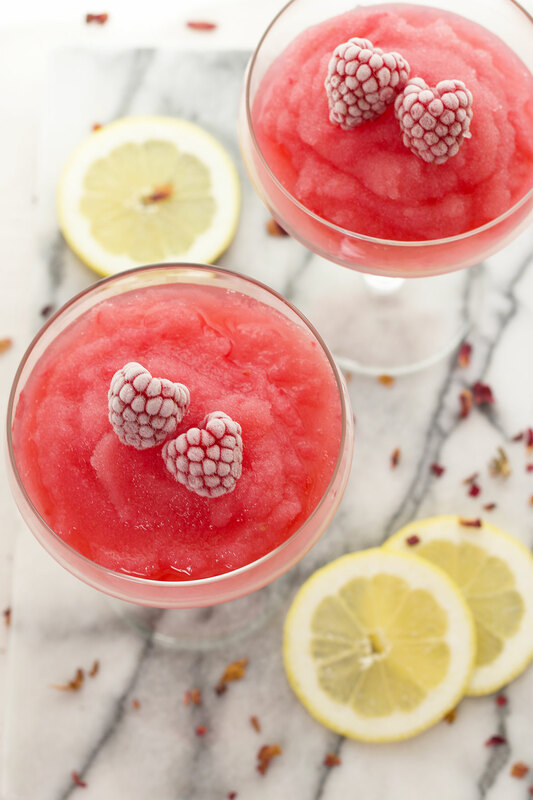 Add the froze rosé to the blender and pulse to a slushy consistency. 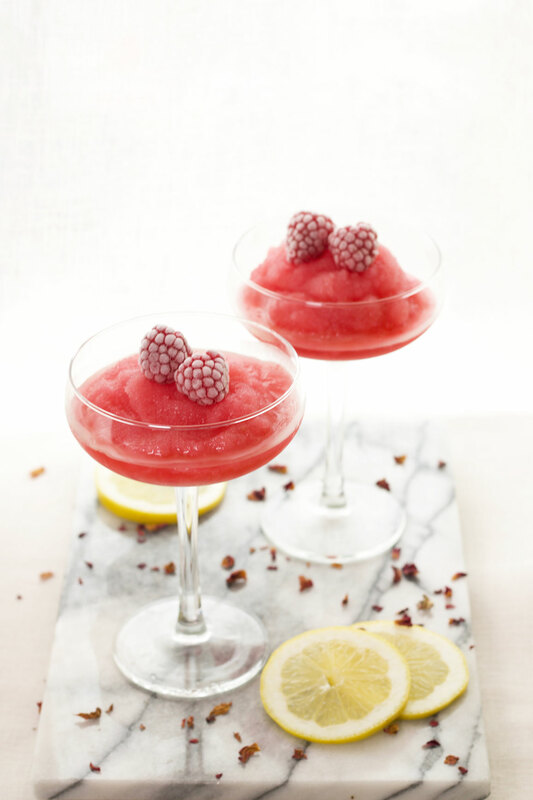 Pour into two coupe glasses and garnish with frozen berries or slices of lemon. Have an amazing Birthday when it rolls round. 28 is just a number, enjoy every minute of it. I need one of these drinks in my life ASAP. So I am stealing this recipe! Thanks Georgie! Go forth and make cocktails, it’s the only way! Great post! The pictures are so nice. Looks yummy. Sounds like an interesting mix, slushies in summer are divine. I hope you enjoyed your 28th birthday thoroughly. Thanks for sharing this simple recipe. Love a boozy slushy in the summer! This looks incredibly refreshing.. perfect for a hot summer night. Thanks for sharing! This looks really refreshing and must try. What a beautiful drink! Raspberries are one of my favorites, as a matter of fact I have some in the fridge, lucky me.